The garden has been one of our most successful to date this year. We are so blessed! 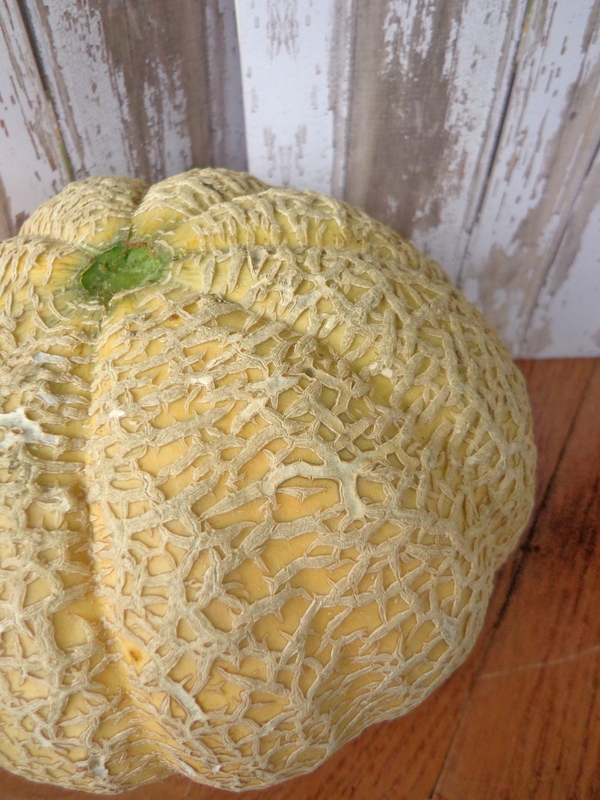 Look at this gorgeous carnival squash – just a dressed up version of standard acorn squash. Five of these beauties are going into the oven for our dinner tonight! 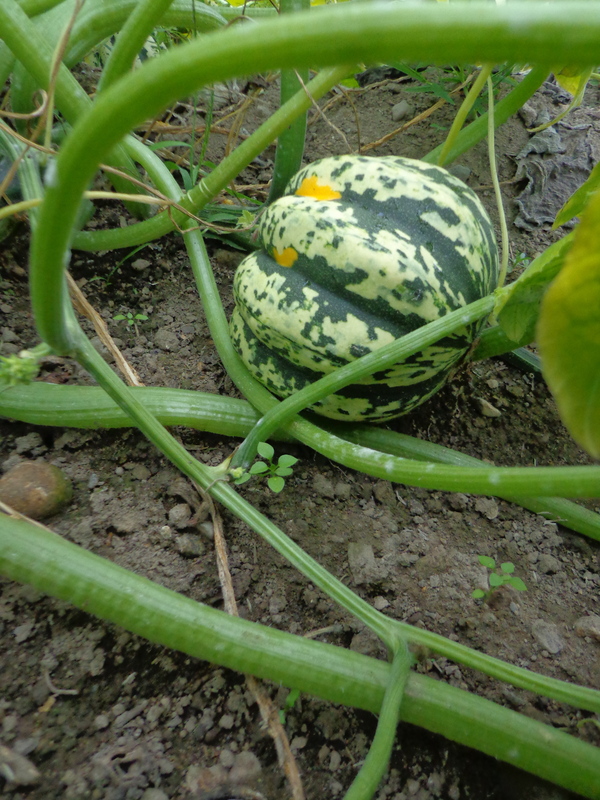 Below is one of our Argonaut Butternut squashes. These babies have an awesome squash to seed ratio. They weigh sometimes 8 to 10 pounds each and store well. They’ll be ready when they reach that butternut squash golden color. 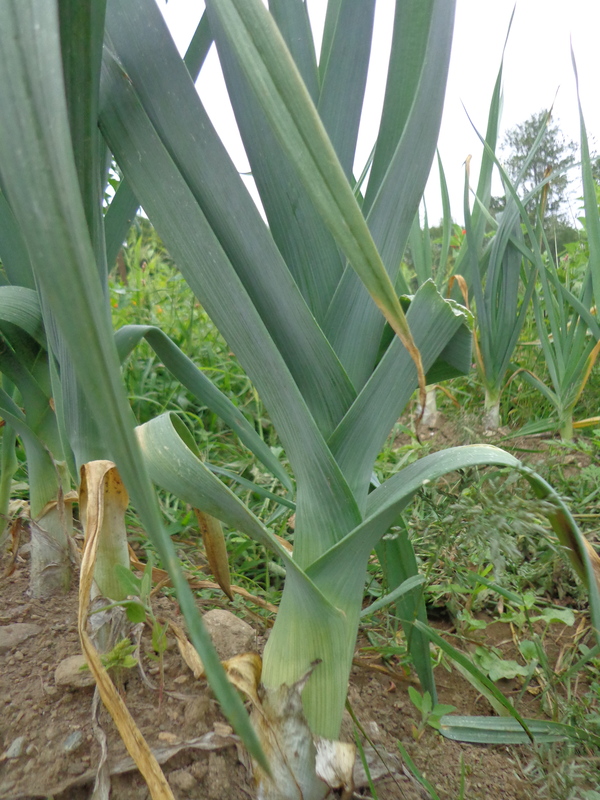 The leeks are ready for picking — luckily they will wait for us in the ground until that first potato leek soup of the season! 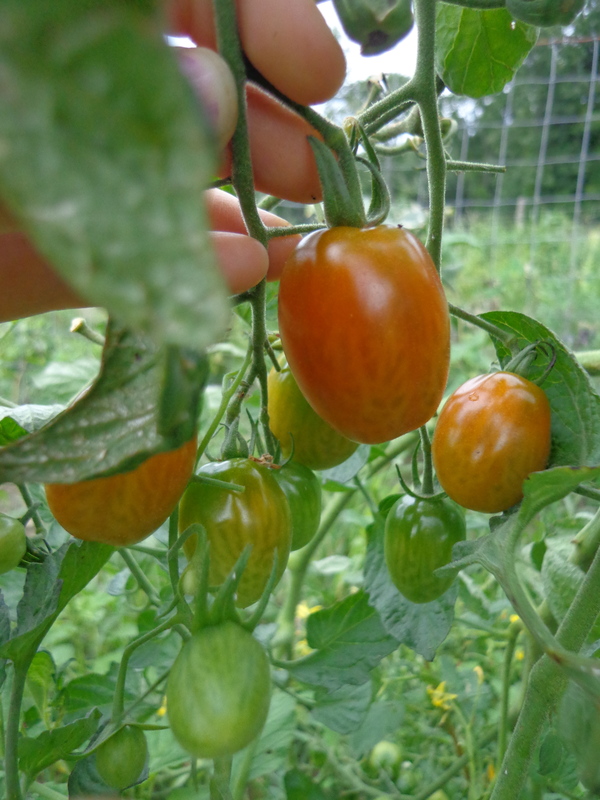 Grape tomatoes keep on coming! 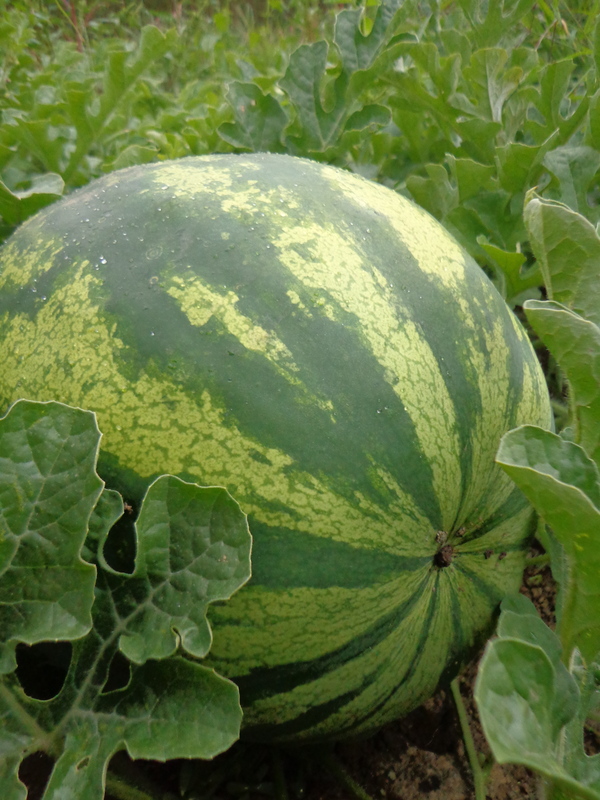 The watermelon are almost ready. This year we planted Orange Krush – yes, orange fleshed watermelon that are very sweet and tasty – at least that’s what the seed sellers said! I can’t believe how big they are! 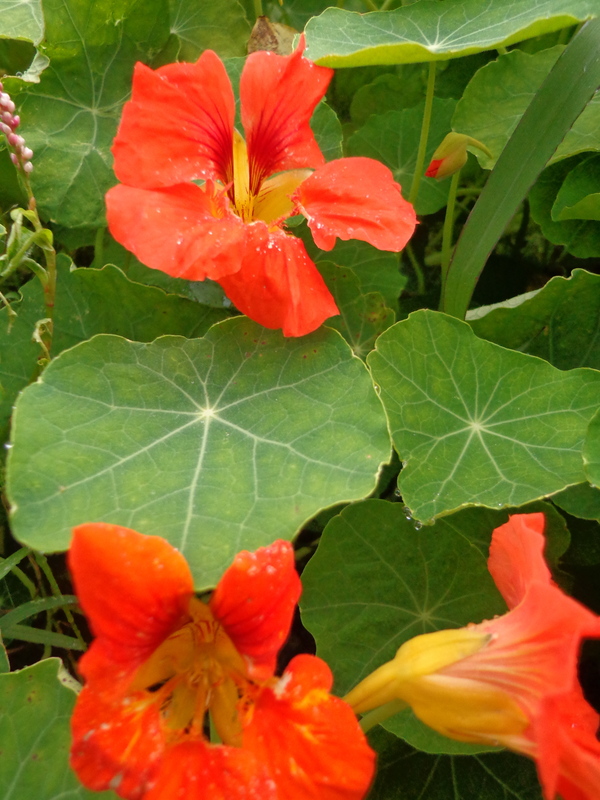 The nasturtium are beautiful! 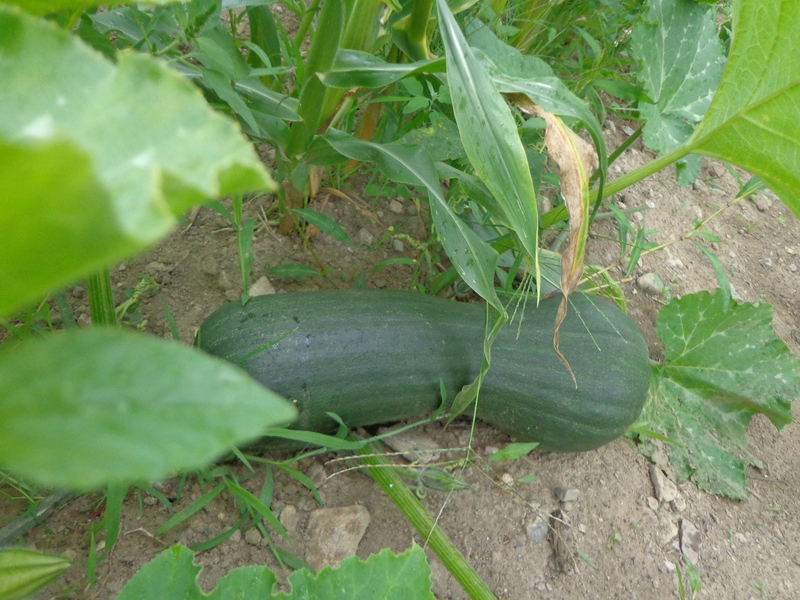 They look good just growing in the garden or garnishing a plate and make a nice peppery taste in salads. On the edge of our property we have a nice crop of Concord grapes ripening. 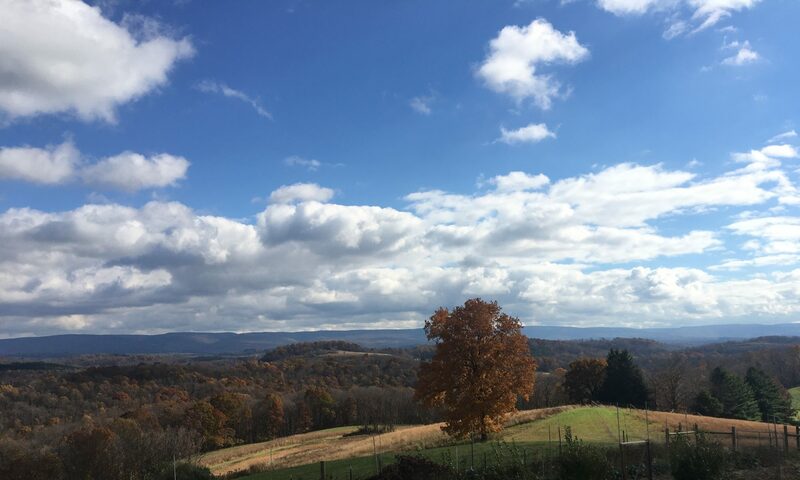 I’m hopeful for putting up lots of jam this fall! 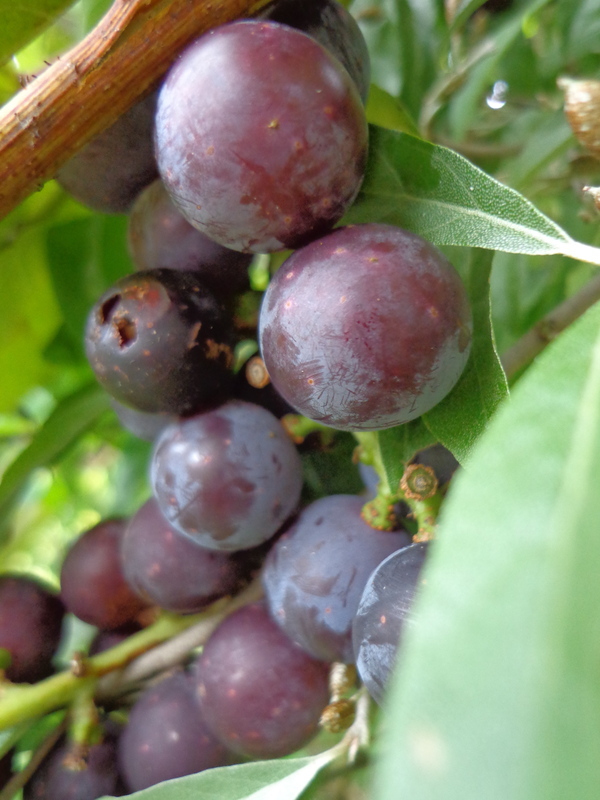 Another jam crop – if we can keep from eating them as they ripen! 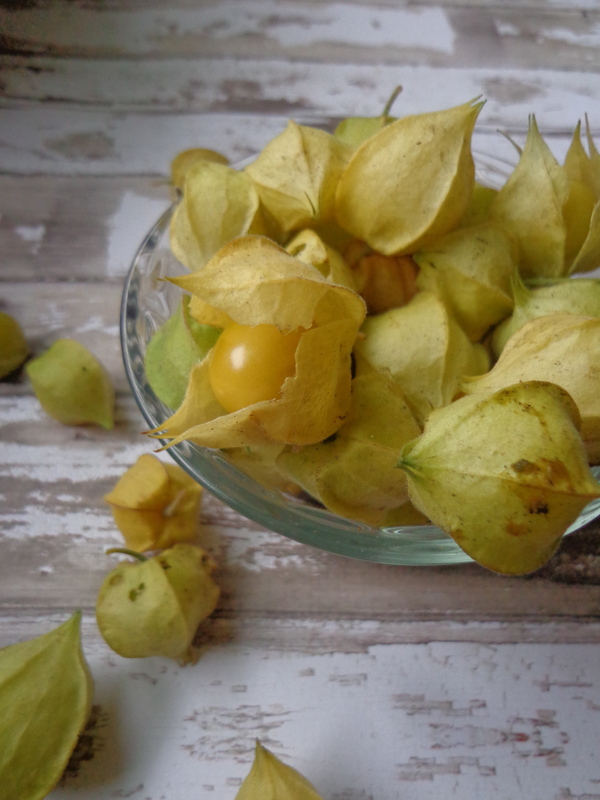 These are husk cherries. To me they taste like bananas. They’re quite unique and supposedly make interesting jam. Next on our menu – we’ll give it a day or two to finish ripening on the counter. The cantaloupe are beautiful this year! I’ve learned not to let them ripen totally on the vine, otherwise we end up having to share them with garden critters who nibble their way in if we don’t get there first! Been having lots of fun this summer trying new things. Not having lambs around is sad, but it does free up time for learning new skills! One very useful thing we’ve finally started doing here is canning. So far we’ve canned beets, relish, pickles, and blueberry jam! We’re getting ready for the onslaught of tomatoes – this should free up some freezer space for us since in the past I’ve frozen my sauce! Another thing I’ve had time for is spinning the winter wool. Normally this suboptimal wool is either discarded or used for felting or even for composting by many Icelandic shepherds. This year, as I was shearing, I noticed that a lot of the wool was quite spinnable – not as matted as usual. Yes, there was hay chaff galore, but I figured why not try spinning as much as I can of it, since all of the fall fleeces were either sold or spun? This resulted in an array of colorful hanks of yarn and has provided the amount of yarn I’ve been longing for for a felted tote bag project. I knew that this yarn would not be nice up against the skin, but for a wet felted knitting project?! Perfect! Once I found the pattern that I liked and thought I was capable of making, I couldn’t wait to get started! First we had to modify the color scheme in the pattern. I wanted to showcase the natural Icelandic fleece colors in the bag. That way, whenever the bag is with me, I’ll always have an Icelandic color pallete on hand! 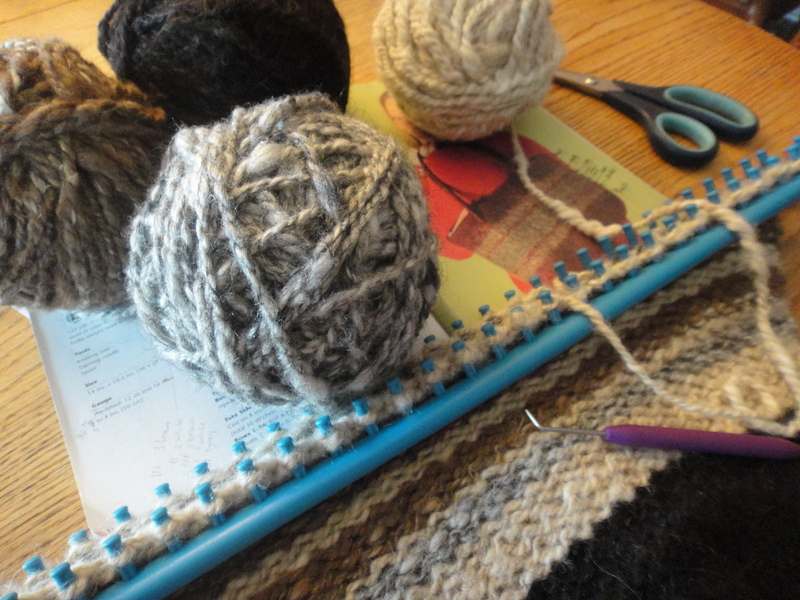 So how, pray tell, did I manage to knit and purl this Icelandic panel? Yes, I know I’ve shown you this device before. I’m loving my Knifty Knitter loom more than ever!! I got a new gigunda one that is allowing me to knit a 50 stitch panel. This bag will be quite large when I finish knitting, then, once the seams are sewn, I will wet felt it in the washing machine, shrinking it down to the desired size, creating a very strong wool bag! I don’t know why, but loom knitting just seems to make more sense to the scientific side of me (again, my apologies to all of my traditional knitting friends.) I see the stitches all laying down, all held tight on the loom. It’s organized and easy to put down and pick up without worrying about stitches slipping off needles. Maybe my love for the knitting loom is a reflection of my overall love for and preference of weaving on a loom vs. knitting, which is why, this summer, we’re also refurbishing the 30 year old Baby Wolf floor loom I bought a couple of years ago, ready for weaving later this summer and hopefully the subject of new post soon, as cotton and patterns are on their way to us for the making of woven towels!